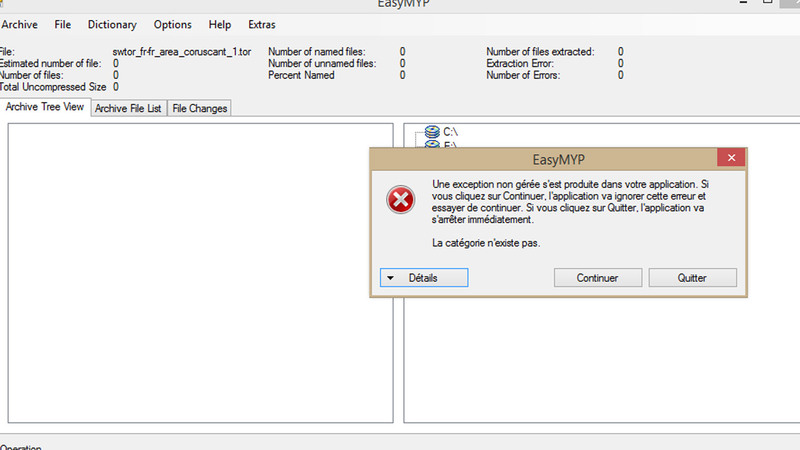 System.InvalidOperationException: La catégorie n'existe pas. Have you already tried this version? Last edited by RealymanLP on Fri Nov 23, 2018 8:38 pm, edited 1 time in total. Have you also tried to rename the .tor file to .myp and import it with drag and drop? I've noticed that every planet in the 1-50 story has it's own musical theme, except for Quesh, and Ilum, which reuse music from elsewhere in the game, and I was wondering if there is a way to find out which planet plays which piece of music and where, so I can attempt to make a fan made theme for Quesh and Ilum to match the officially released tracks? I'm sorry, but unfortunately that's not possible and I'm not very good at English.